Norman Helmet with face plate, the enclosed helmet covered the entire head, with full protection for the face and somewhat deeper coverage for the sides and back of the head. Norman Helmet with full protection for the face and somewhat deeper coverage for the sides and back of the head than that found on previous types of helmets. It was developed near the end of 10th century. 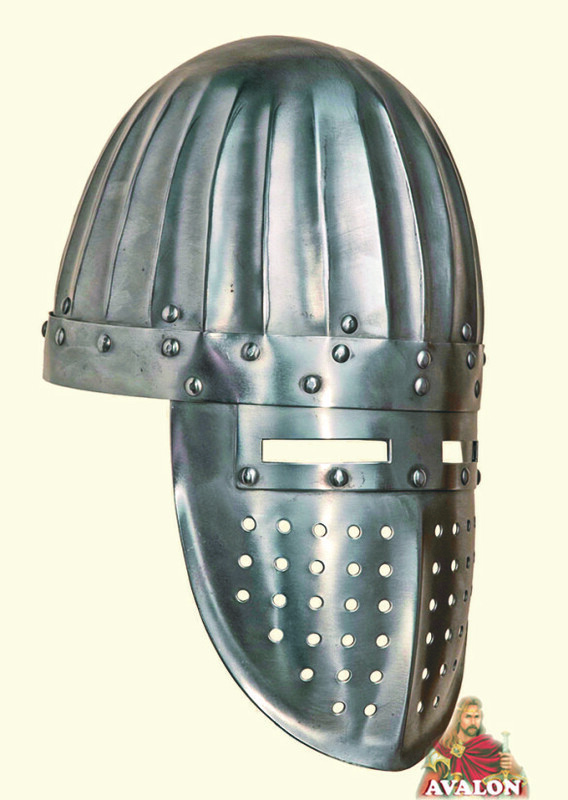 This is a fully battle-ready helmet in the style of a high-medieval Spangenhelm as worn by Normans. The shape with forward bent peak, which remind to early antique forms of helmets. These helmets were mainly worn by Norman knights who trekked from Sicily to South Italy. These kinds of helmets were usually worn together with a chain mail coif.